When you hear the word “affordable” coupled with “high quality,” the results are usually less than that combination of words would suggest. When I lost my competition-grade mouse to an unfortunate high-speed dog running accident I was on the hunt for a new input peripheral. HyperX has been making a name for themselves in the memory, storage, and headset arenas, so it seemed reasonable to test out their new Pulsefire Gaming Mouse (their first foray into the mouse market) to see if it could tackle the wide variety of game types I play, as well Photoshop, video editing, and all of the other mixed-use cases I put my little tailed friends through. The first thing of note is that HyperX continues its software-free approach to their hardware. It truly is as simple as plugging it in and then going to town. This means you don’t need software like Razer’s Synapse software to adjust things like DPI, instead bumping between 400, 800, 1600, and 3200 DPI via a physical switch tucked below the scroll wheel. 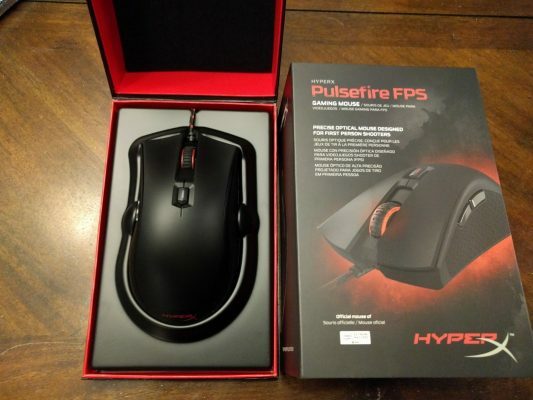 The HyperX Pulsefire uses the Pixart PMW3310 optical sensor, the same one that’s in the Steelseries Rival 300 and Steelseries Fade, the Corsair M45, and the Mionix Castor, just to name a few of the best. All of the aforementioned mice are at least $20 more expensive than the Pulsefire, some of them being nearly double the price. Because HyperX has used this Pixart sensor, there is no need for artificial acceleration of the mouse, which would otherwise cause “jumping” when the action gets hectic. It’s like opening a ring case, except it’s a mouse. There are mice that are advertised as hitting 10,000 DPI or over. The average ‘non-gaming’ mouse is 800 DPI. Obviously hitting upwards of 3200 DPI with the Pulsefire should satisfy all but the most extreme professional gamers, but it’s a preference. DPI means that with a mouse at 3200 DPI I can cross a screen at a 1080p resolution by moving the mouse about a half a centimeter. Many people with mice that can hit those obscene DPI numbers find the mouse movement too fast and end up turning it down anyway. It’s entirely a personal preference thing. Speaking of the scroll wheel, there’s an annoying trend in more affordable mice: smooth scroll wheels. These mice are absolute garbage as they frequently allow you to glide your finger across the scroll wheel without actuating it —entirely defeating the purpose of the object. Additionally, they tend to line the sides of their mice with hard plastic that becomes equally as slick. Conversely, the Pulsefire nails the feel of an extremely high-quality mouse with a ridged and rubberized surface on the scroll wheel, and the same textured rubber on both sides. There is another thing you tend to find in all but the most expensive mice — easily tangled cables with fray points. To combat this, many of the competition-level mice (the Pulsefire included) comes with a cloth braided cable. At just shy of six feet in length, the cable should meet any need you have, but there’s one more feature tucked away right at the point where it meets the mouse body — a rubberized strain relief guard. This prevents the mouse from fraying, binding, or splitting where it actuates most. It’s a little detail among many that really elevates this device among its contemporaries. Digging a little further into the guts of the Pulsefire, developer HyperX (a division of Kingston) has selected Omiron switches for the six buttons on the body of the mouse. There are several players in the field — Omiron, Huano, and TTC. There is one exception where a Cherry mechanical keyboard switch was used in a StarCraft mouse called the Leetgion, but it’s the only example I’ve seen in a mouse. TTC is a Chinese-made microswitch that you’ll often find in those off-brand mice you can pick up for $10 in the checkout line at Fry’s Electronics, often rated for somewhere between 3 and 5 million clicks. Huano-powered mice often have a more stiff click, which some gamers prefer, but are often cited as inferior for high-volume clicking you might find in MOBAs or RTS titles. At the top of the list is Omiron. These are often described as a soft click, able to handle large volumes of clicks with a shallower throw for speed. Best of all, this switch type has a tested 20 million click durability rating, meaning this mouse will last you quite a long time. Ultra-wide skates make for smooth movement. The Pulsefire mouse body is right handed in so far as the two thumb buttons are located on the left side. Other than that, the body is uniform and only curved slightly to the left on the rear. Over the last two weeks of use, I found it incredibly comfortable, reminiscent of mice that cost three times that amount. Much of that comfort comes from the body shape, but I also liked the feet on the top and bottom edge of the underside. Rather than tiny little feet that can get gummed up through normal use, the Pulsefire’s large skates meant far less drag for any game I threw at it. Best of all, it let me tackle finer detail work in Photoshop without jittering. The best feature of the Pulsefire, of which there are many to choose from, has to be the price. All of the details and gear mentioned above should drive the price far higher than the $49.99 price point, but somehow HyperX has kept the price low. There’s far more tech in the Pulsefire than should fit in that tight price point. I’m floored by just how well-built the HyperX Pulsefire is. It has more tech in it than most mice at double the price. Hitting DPI values of 3200, it’ll satisfy all but professional gaming crowd. This may be the best $50 mouse on the market.